Sen. Cory Booker would be one of the primary frontrunners for the Democratic nomination for president if (well, let’s just say “when”) he decides to run. With senators Kamala Harris, Elizabeth Warren and Kirsten Gillibrand, along with a handful of others already in the race, Booker’s presence would make the Democratic primary more crowded and even more competitive. He’ll also be the second black candidate in the 2020 field who has a legitimate chance to secure the nomination – which is unprecedented in US presidential politics and will be a test for what type of black politician can best attract black voters, maybe the most important and loyal portion of the Democratic base. It will also test white America’s readiness for two qualified black candidates vying for their votes in a large, diverse field. 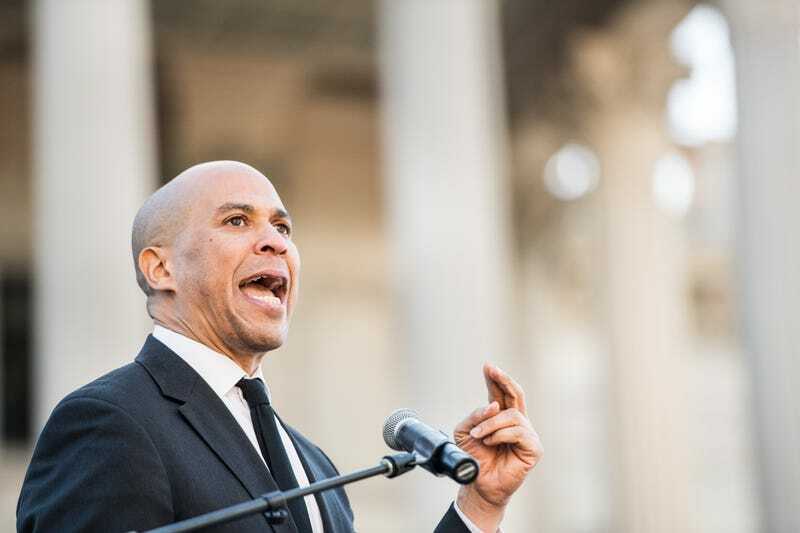 During his sit down with The Root, Booker spoke at length about criminal justice reform and how the Democratic Party should lead on the issue. And he shared his thoughts about Harris’s historic run, if it is OK to call Donald Trump a racist, and if it is worth it for Democratic presidential nominees to seek votes from Trump supporters. This conversation has been shortened and edited for clarity. The Root: So, you know, I’m going to ask you. Are you runnin’ or naw? Senator Cory Booker: I will let you know soon. I’ll make a decision in the next couple weeks, some time in the next month. TR: What are some of the things you are weighing about whether or not you should run? What are those factors? CB: A lot of it’s just a lot of personal consideration, and it’s not a process that I’m going through publicly. But look, I’m closer and closer to running, and I feel a real sense of urgency about this moment in American history. I think a lot of us do. And so, that’s one of the things that’s really compelling me to run. TR: You ever thought that with Trump and his nationalism that’s been rising … I mean, it’s always been here, but his embrace of it, did you think that a sitting US president would embrace it as intensely as he has? CB: No. I mean, I think there were a number of moments where President Trump said really openly bigoted things, like a federal judge couldn’t do their job because of their ancestry. I mean, when he continues to cross lines, push lines, when he continues that kind of moral vandalism, I just never thought I would see somebody in the highest office of the land do that and not have even more of a resounding bipartisan backlash against him. TR: Would you call him a racist? CB: I don’t know somebody’s heart. I would call a lot of the things that he does, are to me, bigoted behavior. I would say that many racists probably think he’s racist. You see white supremacists using his words in their own literature, almost as if they give license. But I’ll let God judge his heart. I just see the behavior. I see the policies and how they’re impacting vulnerable communities, communities of color, LGBTQ Americans. I think all of those things are things that are furthering an effect of injustice and inequality in our country. TR: Let’s talk about the Redeem Act, criminal justice reform. It’s passed, and you were one of the lead negotiators with this bill, and I wanted to ask you about some of the highlights of this bill, because much of it deals with people who are re-entering the society and everything, but what aspects of it are you most proud of? CB: Yeah. Literally, my meeting in this office before this meeting was with the first person released as a result of that. He was arrested in the mid 1990s. He spent 20 years in jail. He probably would have had 10 more years to serve, and this bill released him because it was retroactive. It’s going to affect thousands of Americans, 90% of whom are African American. So that alone, if you had asked me one of the best accomplishments in the bill. But, there’s a lot of other things to give judges more discretion now through outside of the mandatory minimums. That’s really huge. The provision to ban solitary confinement for children is what other countries call torture, what human rights activists call torture because of the punishing psychological effects, and often, lasting psychological effects they have on kids. So there’s a lot of really good things that are going to affect tens of thousands of people in this bill, over time, that will disproportionately affect minorities, and vulnerable communities, and mentally ill. Overall, it’s a very positive step, but it’s only one step. Other reforms we have to do to end mass incarceration in this country and have a justice system that reflects our highest ideals of justice, and not retribution and bigotry and a system that is more cruel than it is about restorative justice. TR: So much of how we view criminal justice as injustice, it’s punitive, right? It’s about punishment. And so what do you think it will take for people to change their mindsets on severe punishment as a way of meting out justice? CB: Our sentencings, guidelines, and we’re so out of proportion to what other industrial nations do. We seem to have this belief that you can just throw people away. But we’re in the United States of America. There should be no throw-away people, no throw-away communities. And so, this is a justice system that is a perversion of our values and ideals of equal justice under the law, the perversion of our values and ideals of being a nation that believes in restorative justice, being a nation that believes in redemption and second chances. And we do things in the system that are not only more expensive, but they create more recidivism. When you don’t treat people’s mental health ailments, when you don’t treat people’s addictions, when you have people that are survivors of trauma and you put them in environments that compound that trauma and don’t heal it, all of these things are really self-inflicted wounds to our nation as a whole, driving up our costs, making our communities less safe, and it’s insulting human dignity. And we need to change this system. It’s a cancer on the soul of our country. It should be an affront to every American. TR: So tell me, where do you think the Democratic Party is right now on criminal justice reform? Where should they be? Where should the party be? Like, what are some main things the party should be pushing for? Particularly, things that you may have wanted in this bill but couldn’t get in. CB: Well, look, first of all, I think it just needs to be more of a center of our focus, a sense of urgency. I don’t want it to be a secondary issue. I want criminal justice reform to be the main focus. Because all the other issues we talk about are related to a broken criminal justice system. There’s a Villanova University study that shows we would have 20% less poverty in America if we had incarceration rates the same as our industrial peers. It has devastated voting rights in this country. Because there are still states that take away your voting rights if you’ve been convicted. It deals with health care and access to health care. There’s so many things about child well-being and educational success that relate to our over incarceration of folks. And so, there’s a whole bunch of things that we should be doing, on everything from police accountability to ending prohibition against marijuana, to getting rid of mandatory minimums, letting judges go back to doing their job. TR: Mandatory minimums. Do you have to kind of force it? Because, I think the way that people run for office is that they’re going to be tough on crime and they just know that they have these mandatory minimums to win. And, is there any legal way, federally, that you can get rid of mandatory minimums altogether? CB: What we did in this most recent bill is we shaved the mandatory minimums down, 25 years, to 20. So we were able to bring down mandatory minimums and give judges a way to get around the mandatory minimums should the circumstances be such that will trigger that provision of the bill. So, there’s nothing we can’t do in this country if we lead with more courageous empathy and a greater consciousness of what’s going to make us safer and stronger as a nation. What is safer for this country? To take a mentally ill youth and throw them in jail at 15 years of age, where their mental illnesses are going to compound or get worse, where they’re going to then be sent back to the street with less of a support system, less economic opportunity, and now they’re going to recidivate again, and again, and again, or, to take that 15-year-old kid and have mental health care in our schools, and empower professionals in an educational environment, actually pay them to do the job. Because mental health is one of the biggest under-funded aspects of our education system. That is actually far cheaper to give people help, than to put them in environments like prisons where they’re going to get more hurt. And people just need to understand the basic economics of this. And it’s something that, unfortunately, we just don’t understand. TR: Sen. Kamala Harris has declared her run for the presidency, and a lot of people are, including The Root, looking at her time as a prosecutor, and as attorney general. I just wanted to ask you your thoughts about her record as an attorney general, then as a prosecutor in San Francisco, being critiqued. CB: Yeah. All the presidential candidates are going to have their records critiqued, and that’s fair game. I know Kamala, who was elected to be the senator for the whole state of California, is used to that. And so, if you set out into the presidential primary arena, you’re going to get analyzed, scrutinized, criticized. And that comes with the territory. She, who I know, and who is a friend, I know she is ready for this. TR: And also, there’s been a lot of conversation in the Democratic Party about Trump voters, right? There are some people who say that these people are Republicans now. These people have clearly decided that they want to support Trump. It’s not even a Republican-Democrat issue. It’s the fact that he has said things that many people say are just so openly racist that those are not the type of voters that you want in the party. In fact, Stacey Abrams, who I’ve interviewed and I’ve cover extensively, says we need to find our people. We need to find people who accept our values, as opposed to trying to find this middle-ground, white, Midwestern voter. If you decide to run, or even for other candidates, should Democrats pursue these voters and bring them onto the Democratic side? CB: I’m the senator from New Jersey, so let me just talk about my state, which has always been trying to inspire people towards our common values, our common ideals. I’m trying to inspire people who live in my community … I live in a inner-city, black and brown community, to get more people to vote. Higher voter turnouts in places like Newark, or Camden, or Passaic, or Patterson help the Democratic Party. I’m also trying to reach suburban voters, though, and understand that we have common cause with each other. We have a lot of common pain around our state and around our nation. We’ve lost that sense of common purpose. TR: What’s the common pain, though? Can you articulate that? CB: Yeah. You work a full-time job in America, and you still live below the poverty line. That’s common pain. That affects people in rural areas, in factory towns, and people in the inner city. What’s common pain? Common pain is that the profiteering going on amongst some former bad actors means that you have to put aside life-saving drugs because you can’t afford them, or have to make a decision between rent. That’s common pain. And we need to have a common purpose to stop that. Common pain is, whether it’s a mass shooting or a Shahad Smith, who was killed on my block last year, that access to those weapons … because we don’t have a comprehensive system of background checks, well, that’s a common pain in America. We should have a common purpose. And so, I could go on, and on, and on. Corporate consolidation, or even a pro-criminal justice system which costs taxpayers billions and billions of dollars, those are common pains that we need to get back to our common purpose. And the greatest of all of our common purposes is saying that this should be a nation where everybody, everybody, has powerful pathways towards life, liberty and the pursuit of happiness. And right now, we just don’t. And so that’s the fight, and leaders who can inspire people, to not try to exploit people’s pain … not try to demagogue and blame others for people’s pain in a demagogic way … it’s Muslims, Mexicans, it’s Chinese, but really call Americans to our higher call and higher sense of purpose. I think that’s when we can make tremendous change. That’s when transformative, societal change happens. We’ve seen the Civil Rights Movement, Worker’s Rights Movement, Suffrage Movement, or like we’ve seen, frankly, in taking a nation that’s gone from sweatshops and child labor to public education and worker empowerment. TR: Thank you so much.